Out in the countryside of Tokyo, several flowers are out in bloom where you could enjoy the exclusive spring sceneries only at this time of the year. Out on the web, you would find many photographs taken of the nature in Japan now which would surely make you feel that you’d like to visit Japan at this time of the year. Many events are taking place as well, regarding the flowers in bloom in the place which would entertain you more when you visit there. Still though, many Japanese women would start to worry about the ultraviolet rays outside, when you could start seeing many TV ads on sunscreen makeup bases or women already wearing sunglasses or even wearing hats with sunscreen cloth hanging down from the back of the hat to guard her neck by getting sunburnt which looks a little odd until you are used to it. Majority of women in Japan would prefer not to get suntan, prefer more to keep their skins as white and natural as possible which would give you various choices of beauty-masks, base makeups, supplements and hair care products preventing suntan. If you are looking for sunscreen products or whitening products, we are sure you could find many products in Japan, possibly good for your souvenir or a present. 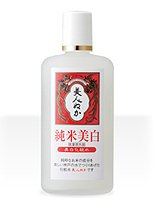 A long-seller skin lotion made frrom rice bran, ‘Bijin Nuka’s, Pure Rice Whitening Lotion’. Photo from Bijin Nuka Store Official Site. Besides being keen on sunscreen, the problem of the season from this pleasant sunny weather would be drying of the air which would give damages to the skin. Comparing to the weather of the desert-related countries, Japan is enough humid but to many Japanese women who are concerned on their beauties, like many women in rest of the world, they would be worried every time of the season about their skin condition. It is certainly more dry in winter when many women would be using or carrying their own base makeups or water sprays to avoid getting their skin being dry but as the sunlight gets stronger now with the problem of the ultraviolet rays, skin-drying problem would be an extra bothersome care for the women. However, the season is now moving to ‘Niji hajimete arawaru’, season when air would start to contain water. Niji is a Japanese for the rainbow which could be seen more, starting from this season when the air starts to contain more water. Because of such atmospheric condition, you would see a lot of haze especially during the day in Japan. Those who are interested in Japanese classical paintings and prints may realise that many cherry blossoms or full moon with cherry blossoms are described in vague tone, expressing the haze that rise a lot at time of the year. The haze occurs often now under sunshine, giving us chances of seeing rainbow more often from now. 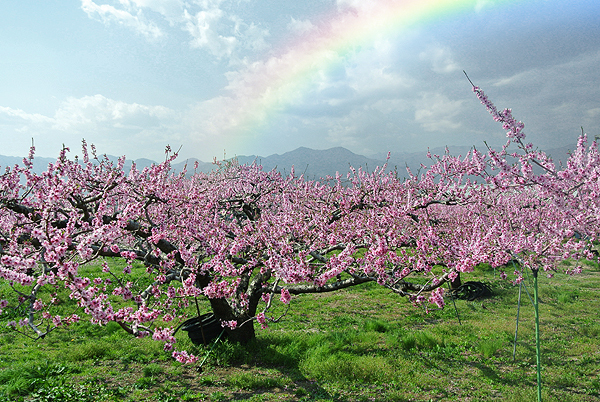 Rainbow after a slight shower over the peach orchard at this time of the year. Returning to the phrase, the next Japanese is the Japanese that we have faced a lot in the past, ‘hajimete’ meaning for the first time. The final verb is ‘arawaru’ which means to appear, but is using the kanjiW which is not used as in the common kanji for the verb ‘ to appear’. The phrase uses a kanji ‘見’ which is a kanji usually used for ‘to see’. Therefore, the meaning of the whole phrase would be, ‘rainbows start to catch eyes (of people)’, giving a forecast of the season that the rainy days are not so far ahead. 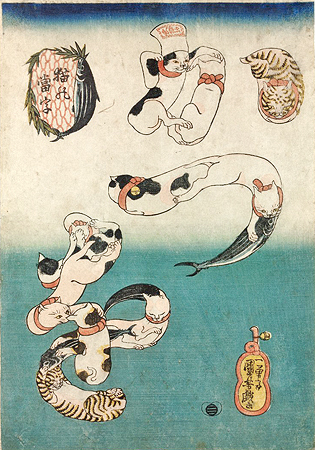 Famous cat figureing Japanese letters, ‘かつを – KATSUO’, the bonito by Utagawa Kuniyoshi. Tuna until 1960’s was so unpopular, was even called ‘猫またぎ / Neko matagi’, the cat’s stride over’, meaning that the cat which is thought to love fish food in Japan would even ignore the tuna, and stride over it. 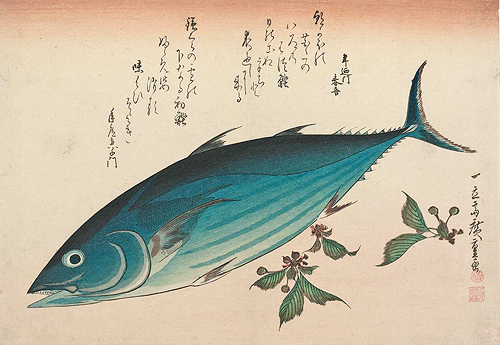 Katsuo drawn by Hiroshige with the poem dedicated to it. By contrast, Hatsu Gatsuo, the first in the market was especially popular in Edo where both rich and poor were wildly excited getting it as fast as they could. Reading the senryu written above, you would know how much one Katsuo would cost in the market at the beginning of when it first appears. Here, one Katsuo costs one Koban. It is quite difficult to calculate the value of the Edo Period currency into present Japanese Yen and there exist various theories, but broadly speaking, one Koban (=Ryo) is said to have valued over 500,000 Yen which surely wouldn’t be a price appropriate for a fish! 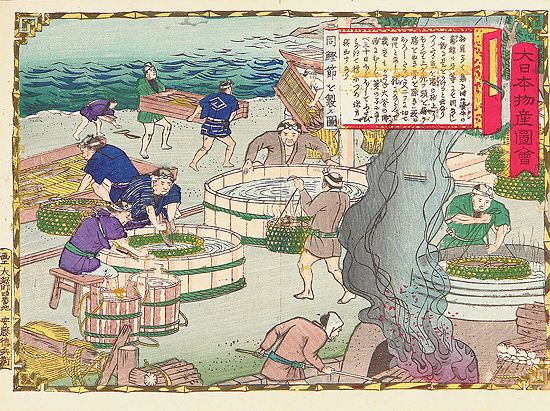 ‘Katsuobushi’ production by the sea as Katsuo would easily get damaged. Workling in speed is one of the important steps in making good Katsuobushi. The fresh Katsuos in Edo period were landed from the sea in front of Edo but the Hatsu Gatsuos were brought by fast horses from the fishing port of Awa provinceW, where Kisarazu, ChibaW is now. Successive shogunWs favoured Hatsu Gatsuo too, were offered as gifts from DaimyoWs (bushiW clans) which have them as their lands’ specialities, wishing shogun the prolonging of his reign as the first product of the season was believed to extend 75 days of life. Moreover, the name given to this fish, Katsuo, has the similar pronunciation to ‘勝男, meaning ‘the winning man’ which were favoured as a good luck fish in Sengoku periodW among the fighting Daimyos whose lands were by the sea bringing Katsuo. As the head of Daimyos and the chief of bushi, the shoguns should have had special thoughts to this fish regarding their fighting ancestors. 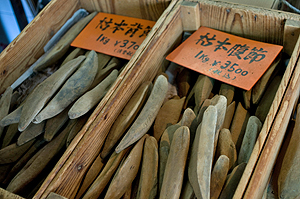 ‘Katuobushi’, a dried, fermented and smoked-Katuo. Looks like a piece of wood, doesnt it? Sengoku period, Katsuo was eaten as it is only by the sea. It was processed as preserves or was used as an ingredient of the fish sauceW before shoyu became more common in Nara periodW. As the size of Katsuo is not as large as tuna, but big enough, and nevertheless being perishable like the tuna, it was within the largest handling size to preserve and be taken to places far from the landing port. Shaving the Katsuobushi to make ‘Katsuobushi flakes’ with special Katsuobushi shaving tool. Photo from Ninben Co.Ltd. Official Site. The dried, fermented and smoked Katsuo is called ‘KatsuobushiW’ which is made out of specific method which was established through the long history of preserving Katsuo, which in the ancient days were only dried or salted. Katuobushi is shaved when used which is one of the ingredients used in typical Japanese soup or cooking stock essential to the Japanese cuisine. It could be sprinkled on to cooked hot rice and tofuW with a little bit of shoyu seasoning, or onto anything, as salads. Katsuobushi with shoyu seasoning is also a popular content of OnigiriW, the rice balls. 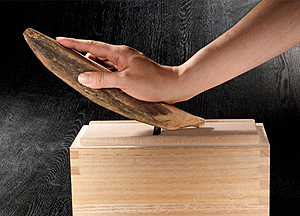 You can see a video by Ninben Co. Ltd., a company dealing Katsuobushi for 315 years this year, in Nihonbashi, on the professional skill of shaving Katsuobushi like a furniture upholsterer with the Katsuobushi shaving tool on the link below. Looks very fun, though very difficult…. How to shave Katsuobushi, by Ninben Co. Ltd.
Fresh sashimi of Katsuo on top and ‘Katsuo-no tataki’ on the bottom. You can see ‘Katsuo-no tataki’ is sold in supermarkets in Tokyo quite often in summer time. Finally, going back to the Hatsu Gatsuo, Katsuo was eaten as sashimi with mustard and shoyu in the Edo period. Today, eating sashimi or sushi seasoned with mustard and shoyu remains only in a few area as Hachijo-jimaW of Tokyo and Daito IslandsW of Okinawa prefectureW. 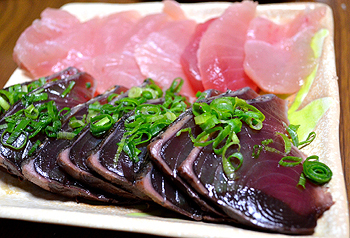 In most areas, sashimi or sushi would be seasoned with grated wasabiW or ginger and shoyu. Sashimi of Katsuo could be eaten when very fresh only, or else could be eaten as ‘Katsuo-no tataki’, also called ‘Tosa-zukuri’, named after Tosa ProvinceW, now Kochi prefectureW, one of the famous place for good Katsuo in Japan. ‘Katsuo-no tataki’ is made from cut-bulk, broiled on the surface, half-raw, quickly soaken into ice-cold water to give a good texture. It is served cut in slices, seasoned with chopped leek, grated ginger and of course, shoyu.